Over one million Americans are impacted with a primary autonomic system disorder, and the more common forms of these conditions include Postural Orthostatic Tachycardia Syndrome (POTS), Neurocardiogenic Syncope (NCS), Pure Autonomic Failure (PAF) and Multiple Systems Atrophy (MSA).1 In addition, seemingly vague symptoms such as unexplained palpitations, gastroparesis, orthostatic hypotension, syncope, flushing, unexplained sweating, abnormal nasal secretions or lachrymation, or sexual dysfunction can signal autonomic dysfunction (AD), especially in patients with diabetes. Other conditions commonly associated with AD are Parkinson’s disease and migraine. AD is often underdiagnosed or even dismissed, since patients may not recognize or report their symptoms, but early diagnosis of AD can be crucial. In diabetes patients in particular, AD has been shown to correlate with poor cardiovascular outcomes.2 Patients with any of these conditions who display symptoms of AD should receive testing, as this can show the severity of the dysfunction, indicate which body systems are involved, and direct a treatment plan. 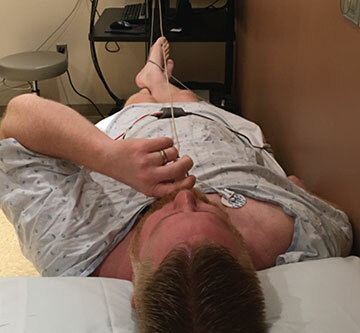 Autonomic testing facilities are not common, and Hershey Medical Center has one of the few comprehensive laboratories in Pennsylvania, which opened in March 2011, according to Max Ricardo Lowden, M.D., assistant professor, Penn State Neuroscience Institute. He details three core tests – all noninvasive – that are commonly performed when AD is suspected. 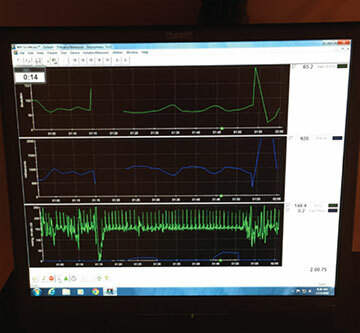 First, the Quantitative Sudomotor Axon Reflex Test (QSART) measures sweat production and can indicate if the patient has a small fiber neuropathy. Dr. Lowden is currently preparing to conduct research into small fiber neuropathy, a form of AD seen mostly in glucose intolerance, diabetes, and other conditions. In addition, the heart rate response to deep breathing (HRDB) monitors the heart rate variability with deep breathing exercises. A patient undergoes QSART testing and Vasalva maneuver testing in the autonomic testing laboratory. Dr. Lowden works to improve awareness of the availability of testing for AD, so that more cases can be diagnosed earlier, leading to treatment and possible clinical improvement. He stresses the importance of early diagnosis since identifying conditions such as autonomic neuropathy can affect patient prognosis. Testing for AD can lead to patients being referred to cardiologists and potentially receiving pacemakers or other lifesaving treatments. This important step is increasingly becoming part of many diabetes workups, as the connection between diabetes and AD becomes more pronounced. FELLOWSHIP: Clinical Neurophysiology, Penn State Health Milton S. Hershey Medical Center, Hershey, Pa.
http://ndrf.org/. Accessed February 10, 2016. Chyun DA, Wackers FJ, Inzucchi SE, Jose P, Weiss C, et al. Autonomic dysfunction independently predicts poor cardiovascular outcomes in asymptomatic individuals with type diabetes in the DIAD study. SAGE Open Med. 2015 Feb 24. Baron-Esquivias G and Antoni Martinez- Rubio A. Tilt Table Test: State of the Art. Indian Pacing. Electrophysiol J. 2003 Oct- Dec; 3(4): 239–252.